Call Us at 866-433-4691 for Help! What Do People Trust DeVries to Shred? In short, you need DeVries Business Services. Unlike other shredding companies you may call, DeVries has the systems in place to ensure prompt attention to your needs and a combination of professionalism and commitment to our clients that is unmatched. How Often Do You Shred My Documents? DeVries shreds for commercial and residential clients in two different ways: on-demand document purges and regularly-scheduled shredding service to fit your needs. Whether you need our secure, locked consoles and containers placed in your office for routine shredding or you have a large pile of obsolete documents you need us to shred right away, DeVries has you covered. We even offer drop-off shredding at our plant for the most economical solution. How Do I Start Shredding? You contact us to discuss your need for either immediate, next-day, or scheduled shredding service and what type of equipment you may need us to deliver, if any. We schedule a time to that works best for you. Our background-screened, uniformed, and badged shredding technician will arrive at your door, ready to do all the lifting and make sure your documents are shredded professionally and securely. You get a Certificate Of Destruction after every service for your records to prove compliance with all the related legislation. As a local, family-owned business that has been serving our community with as many services and for as long as we have, DeVries values relationships and our reputation more than anything else. As your neighbors, we will take great care of you and your information and will consistently provide you with the best overall value to keep you coming back for more. 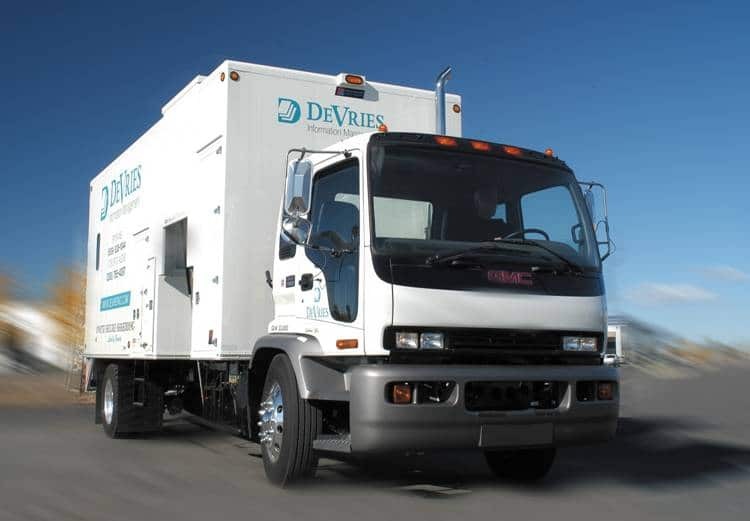 Our clients—including law firms, medical practices, and small and large businesses of all types—not only trust DeVries to shred their documents and destroy their hard drives, but most of them also rely on DeVries for document and media storage and delivery services. Now that’s a relationship built on trust.